Directions: It is located on U.S. Highway 54, about 17 miles north of Tularosa and 30 miles south of Carrizozo. We arrived at Petroglyph State Park sometime before noon and after signing in, we sat down on a bench under one of the small gazebos for lunch. It was strange that the day was hot under the sun, but as soon as we sat down in the shade, the wind seemed quite chilly. We finished our lunch in hurry. The whole trip was a little over one mile. 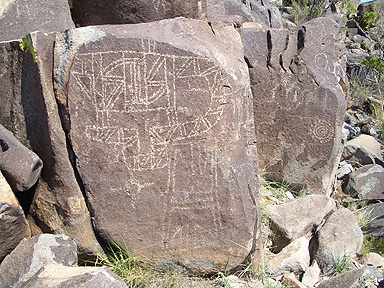 Of course, one could take side trips among the rocks since there were so many petroglyphs on different sides of the rocks. Rocks were everywhere along our path. 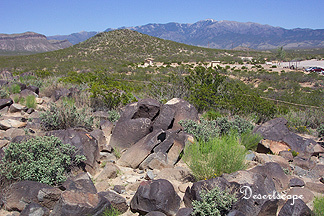 Among large piles of rocks, some of the rocks were covered with black volcanic ash. Carvings depicting various scenes could be found on the black surfaces of the rocks. Following a thin winding path, we walked and talked, all the while perusing the interesting carvings on the rocks. We noticed that there were quite a few depictions of animals. 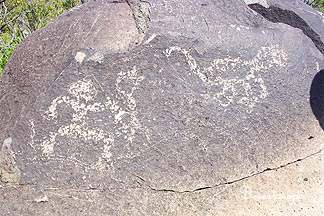 Goats, rabbit, and horses were seen in various sizes on several different rocks. There were carvings of people as well. Some were stick like figures while the others were carved in detail. One depicted the face of a person. With two huge eyes and an expressionless face, the person looked at the visitors in a dull silence. There were carvings of symbols; some were meaningful to us, while others were very abstract. At one point, I saw a cross on one of rock. I figure it probably belongs to some more modern day visitors. One of the carving held most of our attention. It appeared to be a fearsome warrior that was pursuing a tiger (it can’t be tiger since there wasn’t any tiger on the area). Maybe it was meant to be a mountain lion. In one out-stretched hand, a spear shaped weapon pointed directly at the prancing beast. The carving was intricate and powerful at the same time. Suddenly I thought of the movie Ice Age; when Manny the Mammoth was mesmerized by similar stone paintings, the figures waved and shimmered under the light as they bounced to life… I managed to took a few nice pictures. At the half way point, there was a sheltered rest area where we sat down to take a break. The day was getting hotter and we were thankful for the little shade the rest area offered. The path seemed to continue to the other side of the hill, but we were too exhausted from the heat to continue. We turned back and took an alternative path to return to the welcome center. On this side, more carvings were seen. Several of them were rather large and complex. I wonder what it was like when the people who made these paintings still walked among these rocks. Did they think their artwork would draw strange visitors long after they have departed?